‘A modern masterpiece’ is how Victorian Opera describes its new production of Nixon in China. After seeing the production, which showed at Her Majesty’s Theatre, Melbourne, I can say that the description is spot on. In this exciting adaptation of John Adams’s classic 1987 opera, Victorian Opera brings to life a heroic story that transcends its historical roots and has as much to say about modern life as it does about the 1970s. It was in 1972 that American President Richard Nixon, to the surprise of many, broke more than twenty years of political deadlock with the People’s Republic of China and visited the Communist nation. Accompanied by his Secretary of State Henry Kissinger, his wife Pat and a curious team of reporters, Nixon spent ten days in China. There he held meetings with the aged leader Mao Tse-tung, while his wife toured schools and factories. For the first time in two decades, the American people and the world at large were able to see what life was like in China, with the press coverage of Nixon’s visit as historic as the meeting between the two leaders itself. The mystery, intrigue and historic significance surrounding this visit are the inspiration behind the opera. 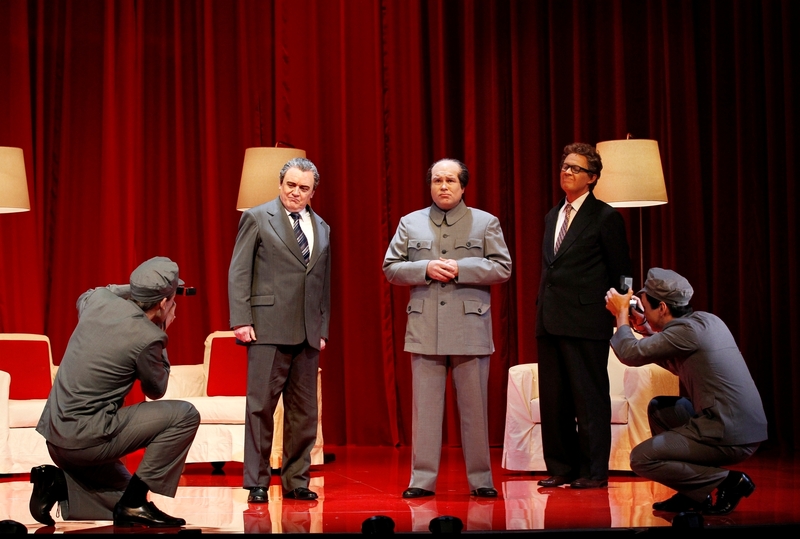 The music, acting, costume and set design comeseamlessly together in Nixon in China. Director Roger Hodgman has crafted a wonderful production that hits all the right notes. John Adams’s music and Alice Goodman’s libretto are given the treatment they deserve, and are performed with a balance of energy and passion. In following the intentions of Adams and Goodman, the production emphasises the heroic qualities of the opera. The strength of Nixon in China is largely thanks to strong performances. Although centred on the meeting of Nixon (Barry Ryan) and Mao (Bradley), it is Pat Nixon (Tiffany Speight) and Chiang Ch’ing, Madame Mao Tse-Tung (Eva Jinhee Kong) who steal the show. The character of Pat Nixon brings a sense of humanity to the story that emphasises the noticeable cultural differences between Communist China and Capitalist America in the 1970s. Her vibrant costumes by Esther Marie Hayes are a refreshing change to the bland uniforms worn by the Chinese. Pat Nixon’s counterpart, Chiang Ch’ing, on the other hand, is a force to be reckoned with. She exudes strength and determination, something that is lacking in her aged husband, despite his formidable appearance and reputation. Jinhee Kong’s performance of the bold aria I am the wife of Mao Tse-tung was breathtaking; a highlight of the production. Andrew Collis’s performance of the shrewd Kissinger was another highlight, as was the compelling ballet sequence in the second act. Nixon and China would be nothing without its music. It is easy to understand why Adams’s music is considered amongst the finest in contemporary opera. Fabian Russell conducted Orchestra Victoria through an exceptional rendition of the score. Possessing a haunting minimalist quality, Adams’s music created an atmosphere of drama and intrigue that reinforced the epic themes of the opera. This minimalism is also seen in the set, designed by Richard Roberts. 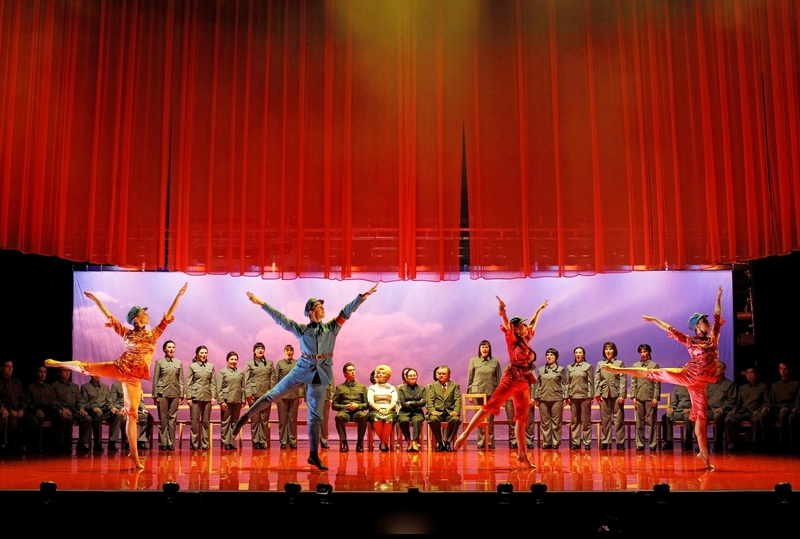 Red, a colour frequently associated with communism, dominates the set (and also Pat Nixon’s wardrobe), which features scant furnishings to reinforce the gulf between the Chinese and their American visitors, and also the utilitarian values of Communist China in the 1970s. Victorian Opera’s Nixon in China is an exceptional production that affirms the relevance of opera in the twenty-first century. This entry was posted in Art, Arts and tagged china, dance, melbourne, music, opera. Bookmark the permalink.